Cat at Heart by Tanya: A Tint of Pink. Happy Belated Valentine's Day! To all my readers who are in a relationship or single to mingle, I hope you had a fantastic day filled with love, roses and chocolates! Going back to school = late night homework cramming and early mornings. I was never a morning person so when I go to school every morning, I don't look exactly in tip top shape. This had lead to my recent obsession with lip balm stains. They are miracle products, hydrating your lips, brightening up your complexion and making you appear more awake. Without having to whip out your mirror and making sure your lipstick is neatly applied, lip balm stains can be applied whenever and wherever. I have raved about this product countless times in blogposts here and here so I won't go too in depth about it but it is just simply a great sheer rose colour that is also extremely hydrating. This product was also extremely hyped up in the beauty blogosphere so I had to get my hands on them as soon as they arrived in Australia. Even though I wouldn't define it as a lip balm, it isn't drying on the lips and I can use it alone without lip balm underneath. It is long lasting and doesn't end up blotchy on my lips. It definitely applies lighter than it looks in the tube, leaving a deep reddish pink tint on the lips and I also love how it has a menthol-ly scent! This is the newest edition to my collection and it is the darkest colour out of three in the collection. 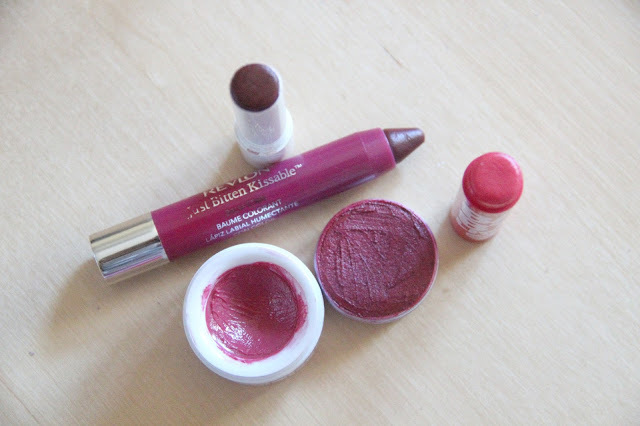 It gives off a subtle deep-red, plummy tint that looks natural on the lips. It is moisturising feels nice on but I am unsure to whether or not I would use it as an everyday colour because it's a bit more dark and lacks the reddish tones that I like in lip stains. This is probably another lip product that I wouldn't exactly call a lip balm stain but I do love it a lot. It is a deep reddish berry colour with a satiny finish and it is definitely the most pigmented colour of the lot. When used as a stain, it doesn't budge and last throughout the entire day. The only negative to this product is that when you apply with your fingers, it does stain your fingers as it is so pigmented so it's best to carry a lip brush in your handbag. I have been gravitating to this product the most, so I will say this is my current favourite! As expected, this was the darker shade out of the two that was available and it leaves a sheer but glossy deep berry pink tint on the lips. It smells of berries and candy that lingers on the lips, which I love and also keeps my lips looking soft and moisturised. Nothing more to want from a tinted lip balm! So there it is! My first blogpost in almost two weeks and I ramble about lip tints. Hope you enjoyed reading it nonetheless and have a lovely day/weekend/week/month/year! I am lusting over Maybelline babay lips , want so bad! I love the Revlon Just Bitten lip tints, they are so nourishing and highly pigmented! 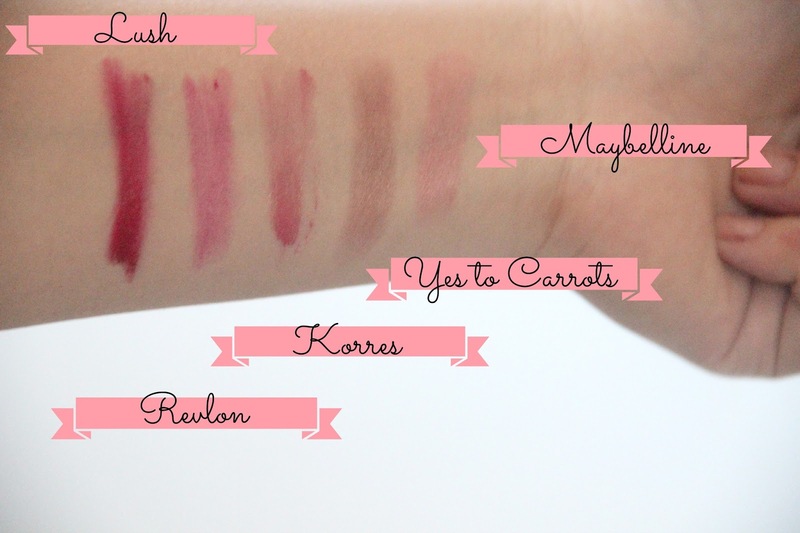 Thanks for the swatches they really help me out figure out which shade to buy. Really want to try the lip butter! Gonna have to try these products. Fabulous post love!